Welp, here comes the inevitable apology for not posting for a while. I completely skipped a Thanksgiving post, but the weekend before I was in Amsterdam and the weekend after I went surfing in Cornwall. Both were unconventional ways for me to kick off the 2015 holiday season, but each in their own way so much more about what I'm grateful for in my life. Thankful for old friends who come to Europe to visit me, and thankful for new friends and a joyful, new pastime that I can't seem to get enough of, even when the wind is howling over the ocean. Both weekends were spent playing outside with my buddies. Truth be told, turkey and pie were completely unnecessary for me to wonder at my good fortune. For those of you who did have your turkey and pumpkin pie, and are now incredibly sick of all things leftover, here is a bit of a palate cleanser. I love this middle-eastern inspired dish, and when you try the tzatziki, you'll find yourself making bowls of it just to have in the fridge as a topping for anything. It's an amazing side to have on a table full of snacks, with a big roast dinner, or topping whatever sandwich you're making. It brings a ton of flavor, but doesn't overwhelm the way that gravy sometimes does. 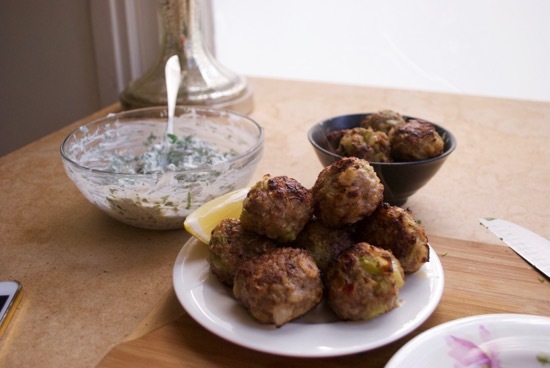 Quick note: I had celery in my fridge so I threw it in these meatballs, but in retrospect, I would leave it out. It added a flavor that was unnecessary and edged the cumin and coriander to the sidelines. When I make these again, I will probably replace it with flat-leaf parsley. Definitely serve the meatballs with wedges of lemon, like the Big Lebowski rug, the citrus zing ties this whole dish together. I decided to try just broiling the meatballs in the oven, rather than searing them on the stove to save on the mess. I was worried that the meatballs wouldn't get a crunchy crust on the outside, but the broiler did the trick and these did get nice and caramelized. Heat up a pan with a few glugs of olive oil in it. Put the onions, garlic, and spices, and sauté until they are soft and fragrant. Transfer this mixture to a large bowl, and let cool for a few minutes. 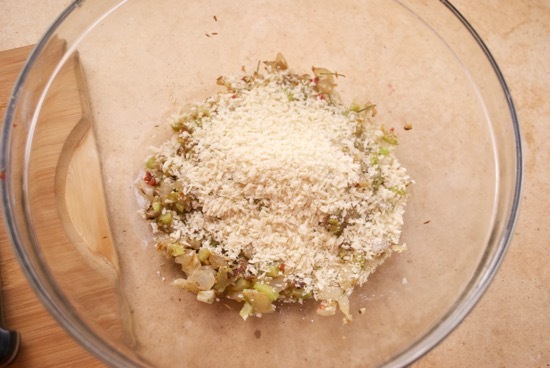 Add the lamb mince, the breadcrumbs, and the egg and gently mix. Form into balls, and place onto a non-stick baking sheet. Put your oven on the highest broil. 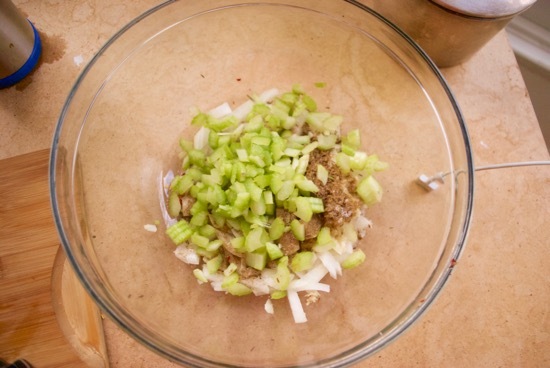 Bake meatballs for 5 minutes, and then give a shake to flip to another side. Continue until the meatballs are cooked through. 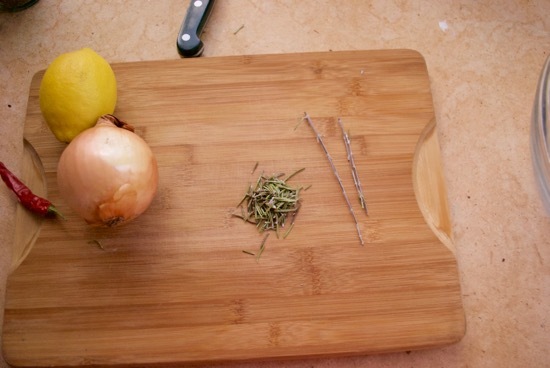 For the tzaziki, mix the onion and the herbs, with a few grates of lemon zest. Serve together with wedges of lemon.